Videos may not be available where you are due to BBC copyright restrictions. Click on "Play" then click on objects in each scene to count. Note: The number "9" in this activity is written differently in Little Wipe-Clean Numbers. Can you count the ladybird's spots? Note: The number 1 is written differently in Little Wipe-Clean Numbers. Note: The number 4 is written differently in Little Wipe-Clean Numbers. Note: The numbers 1 and 3 are written differently in Little Wipe-Clean Numbers. Children can use their fingers on phones and tablets to write numbers and draw pictures. 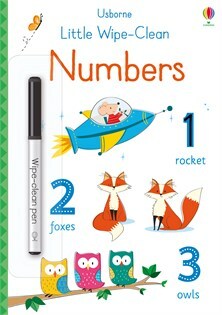 Help little ones learn to count and write numbers up to 100 with this friendly activity book. Durable, wipe-clean pages mean children can practise again and again and there are links to websites with advice and more activities to help children learn to read and write.